Location : Sofitel Hotel BKC, Mumbai where Nick Ord recently curated four special cocktails for the hotel’s specialty restaurants- Le Bar, Tuskers, Artisan and Jyran using brands from Diageo’s Luxury portfolio. Nicholas Ord also known as Nick Ord is the Reserve Brand Ambassador for Diageo’s Luxury portfolio and his responsibilities include, not just travelling around the world offering trainings, delivering concepts and interacting with the sales and marketing team and customers, but also to create experiences that adhere to his ethos – Drink less, drink better. In an exclusive interaction with Rojita Tiwari, he talks about the nuances of the cocktail business, decodes molecular mixology, barrel-aged cocktails and explains what exactly it is to live the life of a high-flying drinks whiz. You have been traveling widely across the globe. Can you share some of your most memorable/bizarre experiences while working in a foreign country? Which is your go-to drink? The Sazerac is my favourite to make, drink and discuss because it has a wonderfully deep history to it. Despite being arguably the earliest ‘cocktail’ to be invented in the United States of America, this drink is fiendishly difficult to make. The recipe includes the erstwhile Rye Whisky or Cognac or a blend of the two, slow-stirred with sugar and Peychaud Bitters, a flash of lemon zest and served in a glass rinsed with French Absinthe for aroma which blends wonderfully with the citrus if done the right way. 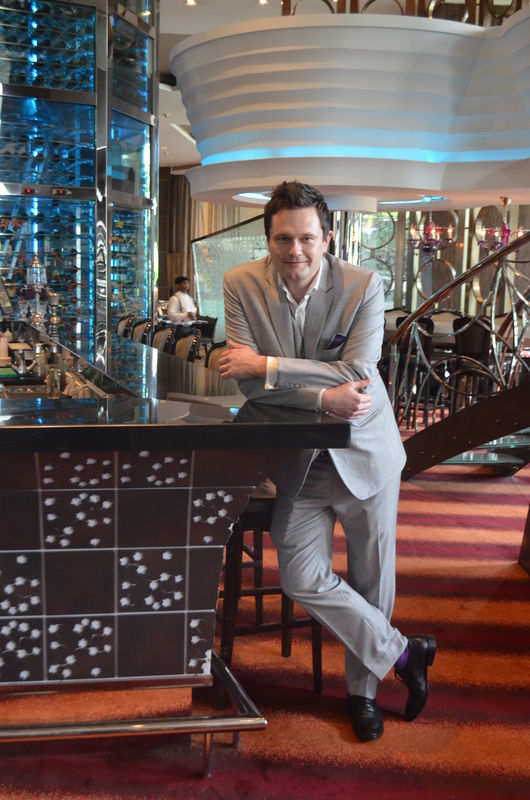 What are the latest trends that you see worldwide in the mixology scene? We are just coming out of a massive Punch-boom, which is fascinating for this market because the Punch has its origins here in India, where sailors would drink a concoction of five ingredients, ‘alcohol, liquor, sugar, water and spice,’ (hence the name ‘Punch’, from the Sanskrit word for ‘five,’ ‘Pantsch’). Other recent trends include return of fresh seasonal ingredients with simple drink recipes, an interesting revival of low-alcohol drinks and cocktails revolving around Wine, Sherry, Port and Vermouths. Menu designs are increasingly leaning towards a short list of 5 – 8 drinks that are regularly rotated as compared to tome-like pages of beverages in the 1990’s and 2000’s. Bars are also pursuing the perfect ‘sense-of-place’ that makes an offering unique to their outlet as a USP and talking point. Did it ever really exist? What the phrase ‘molecular cocktail’ means now and what it did originally are now two very different things. The pioneers of this new phase in both mixology and gastronomy via pioneers like Heston Blumenthal and Tony Conigliario via French Chef Herve. The chef and the Hungarian scientist Nicholas Kurti were fascinated by the idea of breaking ingredients and process down to a ‘molecular level. The phrases often associated were terms like ‘deconstructing’ flavours, textures and aromas and then ‘reconstructing’ them in unusual ways. So they would make ice-cream that tasted like bacon, sausages that tasted like strawberries and so on. The process took on a ‘lab-coat’ scientific image by their use of chemical texturisers and emulsifiers such as Xantham gum and Methyl Cellulose (when simple ingredients will often do the same job). However, the term ‘molecular’ has now become a catch-all for any new developments in the beverage scene. To quote famous London bar operator and bon vivante Jake Burger, ‘the alcohol we drink now is probably the best the world ever drank’. As such the barrel-ageing of drinks, carbonation via Perlini or Soda-Plus, dehydration of alcohol into ‘dust’ and cotton-candy, binding oil and water via sonic homogenisation and cooking via vacuum in a sous-vid etc are all considered by many to be’ molecular’ despite none of these really following the true original sense of the idea. A ‘normal’ cocktail has therefore become any drink that uses ‘traditional’ ingredients and methods only, such as muddling, shaking and stirring. But really what are bitters except a binding agent no different to methylcellulose? And what is egg white if not an emulsifier akin to Xantham gum. And as for carbonation, I had a soda-stream machine as a child, and my grandmother made ‘carbonated’ ginger beer using old-fashioned baker’s yeast. What is interesting is that one hundred years ago the Old Fashioned cocktail was at that time a protest against what became known as ‘Fancy’ cocktails. The current trend towards simplicity and fresh ingredients mirror this reaction.Hence, cutting it short, in my opinion, molecular mixology does not exist anymore and occupancy are on a constant rise, even in these summer months. However, being cautiously optimistic, we continue to lay focus on project related businesses, Meetings, Incentives, Conferences and Exhibitions (MICE), exotic food festivals and unique spa treatments. How has ‘mixologist’ as a career option evolved over the last few years? Mixology as a skill is something I love, the delicate art of creating new flavours and combinations along with dazzling new serves that tantalizes the senses, is something I would never give up whatever my role maybe. The skill of a bartender is 90% hosting, entertaining and making people happy, with the remaining 10% covering everything else, from stock control to spirit, beer and wine knowledge and yes…. mixology. There has never been a better time to pursue a career as a bartender and we are truly riding the crest of the greatest golden age in drinking since Prohibition America. The internet has allowed unprecedented access to the classic drinks, bartenders, menus and books from the last 200 years that have never before been so freely available. This has led to a dissection of all that has come before and the hyper-analyzing of trends going back to the first recorded written instance of the word ‘cocktail’ in 1798 to its first definition in 1806 and origin of the word itself (which is older than the word ‘hello’). Aspiring bartenders today can announce their ambition with pride. I remember quitting my sensible job with HSBC bank after graduating with a BA in History and Politics with Philosophy from the University of Leeds, to become a bartender. The disappointment in my parent’s eyes and disbelief of my peers, ‘You are going to work in a pub selling beer, when are you going to get a REAL job?’ Times have changed for the better and my parents are now very proud of my success. If you get to choose few ingredients on your own and of course the base spirit, what cocktail would you make that may represent the spirit of India? India being one of the largest producers of sugar cane in the world, my first thought would be to implement it with rum. Ingredients-wise, I would experiment with the classic Indian spice, garam masala or even other rich ingredients such as cloves, cinnamon, vanilla, peppercorns, star anise or cardamom. All of these flavours go great in a Ron Zacapa Old Fashioned or Sour, or with feisty Whiskies like Lagavullin 16 Year or Johnnie Walker Platinum Label.